New games like Guitar Hero are bringing music making to the masses, and Josh Randall, Creative Director of Harmonix (and a CDM reader, to boot) thinks the trend is just getting started. 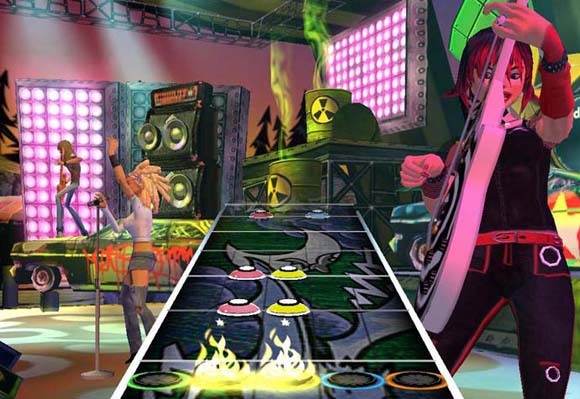 Aside from Guitar Hero, Harmonix has given us Frequency, Amplitude, Karaoke Stage, and they’ve got more games in store, including a Guitar Hero sequel announced at E3. But it’s not just about these games. He’ll discuss the role of creative expression within the game space, and how new interfaces and controllers are changing the way we interact with our music and TV’s. Music gaming is bringing more and more people together every day, so what is the social impact of these games? Let’s peer into the future of music gaming, and ponder what might be coming next. Sounds good to me! If you’re in London, I hope you’re at this keynote and will let us know how it (and the rest of the conference) goes! If not, I hope to check in with Josh soon for some of his thoughts. Oh, and maybe I’ll even be able to sneak a peak at Guitar Hero 2. Of course, not everyone is going to want to go buy a box, unbox a commercial game, and use it as is. Before Guitar Hero even came out, I suggested some people would want to hack the thing for their own purposes in Max/MSP. Sure enough, quite a few people did (most likely entirely independent of my writing; I won’t take credit for that! ), and Cybersonica organizer Chris O’Shea did a great round-up of Guitar Hero hacks while we at Team CDM were busy wrangling with our servers. Go check it out, and if you have a gaming hack of your own, let us know about it! I’m going to hold out for non-guitar controllers, myself, but I love the idea.